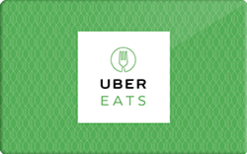 Buy a discounted UberEats gift card to save money on top of sales and promo coupon codes for the best deal. Uber gift cards work for Uber Eats. You will need to enter the gift card serial number in your payments in the Uber app, but when you purchase food for delivery on the UberEats app, it'll automatically deduct from the gift card balance you entered in Uber.